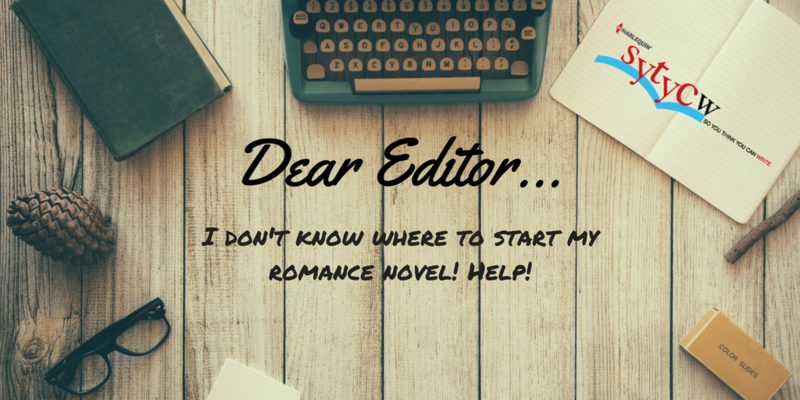 Dear Editor, I don’t know where to start my romance novel! I don’t know where to start my romance novel! Help! Never fear! You’re not alone in this quandary. Sometimes, a writer will pen several chapters before realizing that the story really begins on p. 23. This is what crafting and rewriting is all about! The more you write, the more your instincts will kick in as far as where to begin your story. If your characters are doing a lot of driving, preparation beforehand. Are they thinking and driving to get to that exciting place where they need to go? Is your heroine trying on a lot of dresses and agonizing over which one to wear to the big night out? This can take up ten pages at least, ten pages the reader doesn’t care about. You want to begin at that exciting destination, not en route. You are downing your reader in backstory. Of course, you need to inform your reader, but it doesn’t have to be at the beginning. You can weave in that backstory gradually. You want to capture the intensity from the very first page. Clichés can kill plausibility! Are the hero and heroine literally bumping into each other and does the heroine drop everything in her hands as a result? This is a cliché, one of those acts that occurs in so many stories. Be creative about how the hero and heroine meet and make it realistic (as much as possible). So if you nix the dress scene and the heroine’s life story and the predictable “meet cute”, what’s left? How can you avoid the lackluster opening? First, consider that editors read so many beginnings of stories. Some of us only read that first page, while others go a little further. Ideally, you want the editor to read that entire book. But let’s take baby steps and focus on the beginning and how to fine tune it to grasp your reader’s attention. What gripping interaction or conundrum can you present on that first page? Again, avoid clichés unless your voice/situation puts a different spin on them. What is inviting the character into the journey? Did the heroine just make an offer the hero can’t refuse or visa versa? Did the elevator stop working mid-floor, leaving two people stuck with each other for twelve hours? Watch the language. Some writers can pull off the ultra-descriptive opening with the low-hanging clouds, sliver of moon piercing through on a dull, dreary Sunday. But sometimes, the flourishes fail miserably and we editors skip over them. See if you can communicate a provocative situation/POV in the simplest language, then embellish from there. Get to the heart of your character on that first page. Whether it’s the hero or the heroine, let us know who he/she is. Editors love to fall in love with characters, so let us do that from page one. How is your hero or heroine lovable? You can do this through point of view, but really dig deep. Give us the hooks! Along with character and premise, it’s important to show us the hooks of the story early on. Is the setting unique or one that readers love? For instance, is the story set in a cozy small town or glitzy urban environment? Is the heroine a single mom? How did two strangers wake up married? Once you digest these points above, you can start in a place that makes the reader never want to put down the story. Even better, you might have more fun writing. We hope you find these tips helpful, and best of luck with your winning beginning. The station was emptying of the evening rush. Gone were the bowler-hatted bankers and the lines of soldiers on their way to the front. A solitary guard swept the platform and a newspaper boy pushed his empty barrow towards the exit. The girl was waiting by the telegram office. Riley had been right, she was beautiful. Red curls stole from underneath a neat navy hat and the light cotton collar of her dress was matched by the white of the row of small buttons that ran from its scooped neck to the hem. Long elegant fingers clasped a small clutch bag. Her foot tapped a light and impatient rhythm on the grey concrete as she waited. Mark hesitated for a few seconds before walking across to her. Sometimes this seemed a heavy price to pay for friendship. By nature Mark was honest; he hated secrets. And yet here he was making up stories to cover for Riley. “It’s Miss Riverton isn’t it?” he asked her. “Ginny,” she wrinkled her nose into a small puzzled smile. “I see,” she said. She smiled and nodded as if it was a joke. Mark noticed her blue-green eyes. “You’ve come to tell me that he’s not coming,” she said. It was hardly fair to call the late lunch with an old flame ‘studying’. How dare Riley use him as a go-between for his sordid little affairs? It wasn’t the first time he had been ‘delayed’ in the snooker hall or at the horse race. It didn’t take much to disturb Riley’s diary. Anything could, and would make him late. And that was where Mark came in handy. “Be a pal old thing,” Riley would say. “Take a message for me. Say it’s urgent, something’s come up. I’ll only be an hour late. Keep the girl warm for me. You know the drill.” And he’d smile in that way he did and before Mark knew it, he was halfway across town repeating excuses he would never use himself. And still women loved Riley. They seemed to fall over one another just to be near him. With his blonde hair and light blue eyes he had only to smile at them and they were besotted. He never saw a girl for long. He was careful to make sure that all his love affairs were just that. “Don’t want any little Rileys running around do we?” he would say to Mark. Mark wondered sometimes how he could have a friend like Riley. “Don’t know why I do it,” he’d say. It was a moment that had changed Mark’s life. And whenever he felt that Riley was taking him for granted he reminded himself of that lonely, friendless boy who’d suddenly found that he had a cousin. Linnea Sinclair (Science Fiction Author Genius) once said to start the story at the point in which the Heroine starts a fire she can’t put out. For a while, this had me always starting at the Catalyst. Then, I would have to reverse-engineer until I really found that point. Now, I’ve figured out what I tend to do. So, I go to the Catalyst and then I reverse-engineer automatically. Lo and behold, there it is, the starting point. Wow what a great experience thanks. Hi My mon and I used to read Harlequin books all the time unril the language got too dirty. Romance does not mean that you have to be nasrty; instead why can’t they be more private about the filthytalk that they use. I am no Author, but I love to write. I’m writing a romance trilogy in third person omniscient. I’m being told publishers only want third person limited. Do you publish third person omniscient? “In triple degree weather, Ethan? Take your shoes off and climb the ladder with me,” snatching Ethan’s hand. “Get a bucket. The Spanish Moss is so thick on my roof I’ve planted Appalachian Strawberries up here. “I tried that when I didn’t want to eat my peas.” His smile was a welcome sight. “Yum,” taking a bite, “there in season.” Juice spilling from my mouth. “Try one?” Putting a strawberry between my lips. “I have your dinner.” Putting the strawberry, I’ve holding between my lips. My old comment is still in this thread and it’s proven correct over time. So, at this point, my best advice is to figure out your own writing weaknesses and learn to work with them. Other people will have useful advice, but you need to know yourself before you can make it work for you. I usually start writing a scene or idea, without an intent of turning it into a story. This can back fire a little when it comes time to edit and I have created three “beginnings” to the story. But it’s fun. Thank you Patience. I feel like I am doing that. I believe my opening is strong and engaging. I love my heroine and I hope the editors will as well. 3/4 ways through the book. I’m almost done!